Our range of products and solutions are some of the most respected in the industry, protecting and preventing outage in key assets following major flooding incidents. Providing a water and chemical proof barrier, Polyurea coatings add structural integrity to any surface and are guaranteed to extend asset life by at least 10 years, effectively protecting assets including fuel, chemical, and food storage tanks, substations, and switch-houses from ingress and the damages often caused by severe flooding incidents. JBAR®, our patented modular flood defence system, provides an extra layer of resilience and protection, retaining oil and pollutants in the event of a incident, as well as preventing flood water ingress. When combined, our Polyurea coating and JBAR® provide a total flood defence solution superior to any others available on the market. 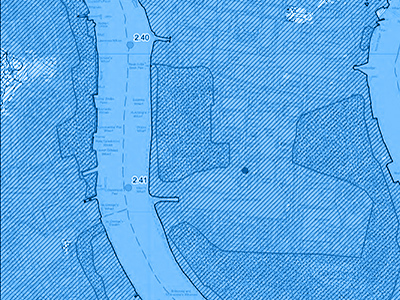 Adler & Allan offers a 360 approach to flood planning and protection. Our specialist technologies help companies to understand their flood risk, and plan and prepare for flood incidents. Our flood experts have access to a wide range of flood resilience products from leading manufacturers, such as self-closing products, the latest flood door designs, pumps and inflatable booms, as well as an innovative, self-inflating alternative to sandbags for quick and easy deployment for emergency flood and spill situations where time is of the essence. Disposable without impacting the environment, the SoakBag TM is our flood, leak and spill defence system, designed to rapidly absorb up to 22 litres of liquid. Weighing just 200g before use, SoakBags TM are significantly easier to deploy than traditional sandbags. With one person able to carry 20 with minimal effort, they can quickly be transported throughout affected sites to form protective walls that minimise flood damage and ingress. Protect assets from flooding to keep them working whatever the weather. Reduce the risk of downtime and financial penalties, and stay compliant. Reduce your equipment and building repair costs by preparing for flood events. Minimise fines for loss of service and environmental spills. Adler & Allan provide flood mitigation and protection services for a number of critical fixed assets. These services and solutions include steel security flood doors to protect door apertures against flood water, non-return drainage valves to prevent the back-surge of flood water and ingress, and self-closing air bricks that allow air to travel through but restrict flood water flow. 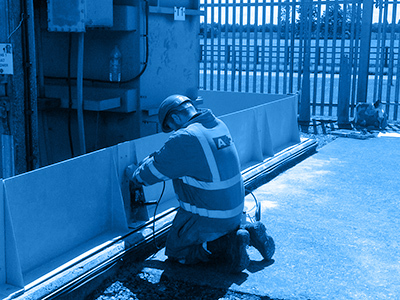 As well as duct sealing services and our patented modular flood defence system, JBAR®, we also offer structural reinforcement in the form of Polyurea coatings, which are designed to provide comprehensive waterproof protection for buildings and substation assets. Polyurea coatings are also suitable for roof lining applications. Building on decades of experience in emergency response, we offer a wide range of services to place organisations one step ahead, both before and after disaster and disruption strike. 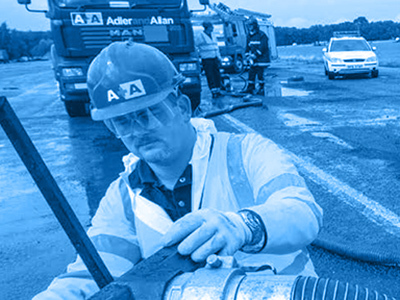 Our on-site preparedness measures include everything from comprehensive flood risk assessments based on accurate historical data and countless other environmental factors, flood surveys providing an overview of every vulnerability present in your assets and subsequent suggestions, and location-specific outlines of the action required to minimise damage and disruption post-flood. To effectively extend asset life and protect assets from flooding, we also offer a variety of flood protection solutions including jetting and drain clearance, flood pump servicing and maintenance, flood event planning and training, wedge barriers, and innovations such as SoakBag®: our flood, leak and spill defence system capable of rapidly absorbing up to 22 litres of liquid. Adler & Allan is the industry leader in emergency and disaster response services. Through many decades of experience, we have developed the capabilities, resources and skills to tackle the most serious environmental disasters, offering 24/7/365 emergency contingency and remediation services for DNOs. Nationwide tankers and pumping services enable us to rapidly deploy flood kits to affected sites, while flood monitoring and warning capabilities enable us to place organisations one step ahead of danger at a time where climate change is creating increasingly severe floods risks. Where flooding does occur, we have the resources necessary to react quickly and minimise any downtime and damage to critical infrastructure through leading post-flood clean up and sanitisation services. A regional DNO had identified significant water ingress to a substation basement. The deterioration of some structures and transformer bunds had been identified as a widespread problem for DNOs, with both spill containment from transformer oil leaks and substation operational failure high on the risk assessment agenda. Adler & Allan was asked to inspect the site and carry out any recommended remedial works and specify appropriate flood mitigation measures. Our inspection revealed some fundamental structural problems with the basement. There were a substantial amount of cable duct entry points to the building which had either no seals or failed seals allowing both groundwater and floodwater to enter the basement. There was a significant threat of flooding to cause damage and loss of power to the electrical equipment. In addition, the basement floor screed was crumbling, as was the mortar at the joint of the walls, all of which exposed further vulnerabilities to the power source in the basement. There was a permanent presence of standing water within the basement. It was noted that the basement would benefit from a protective coating. All these problems had to be remedied before coating could commence. Our priority was to carry out the works with the minimum disruption to the DNO’s operations. As is always the case in a hazardous environment, the works were supervised by an Adler & Allan Competent or Approved Person. The client specified sealing the cable duct entries and providing 2 no. sumps with pumps and a sealing to the floors. The existing duct seals had to be removed and redressed for the application of CSD rise sealing system. The sumps provided another issue in that there was no record of the floor slab thickness and the site was in very close proximity to a river. We designed large shallow sump pits with debris mesh frame surrounds with a series of interconnecting floor channels. We then commissioned two bespoke pumps to be built to overcome the need to break through the floor to form traditional sump pits. Finally the floors were sealed. The assets were no longer exposed to water ingress, and were resilient against further issues. Our approach, combining traditional repair methods with innovative technologies, allows the work to be done quickly (often within one day) and with little or no impact on the site’s operations. Substation restoration also enhances the value of the DNO’s assets.